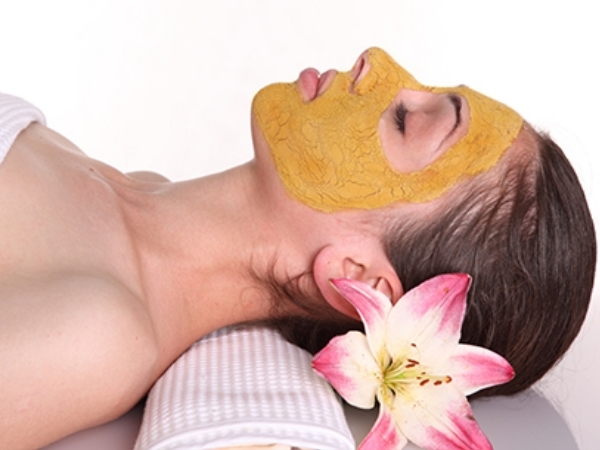 Being a die-hard beauty junkie I love indulging in fancy facials and spa treatments at the salon. But when it comes to daily beauty, I prefer it low-maintenance! And why not? After all, not every time one has the luxury of time and money to splurge on expensive salon treatments. This is where the power of a simple at home face mask comes into play as a relatively low maintenance and affordable way to primp up your skin at the fraction of the cost and time. And my go-to favorite low maintenance face masks for glowing skin are by far the clay masks or Ayurvedic face masks. They are natural, do not irritate the skin and suit most skin types. Best part, you can reap in the benefits while being productive at the same time. You can shoot off e-mails, catch up with friends on WhatsApp, bake cookies or watch your favorite TV show and still get your skin feel squeaky clean and pampered with the mask on! 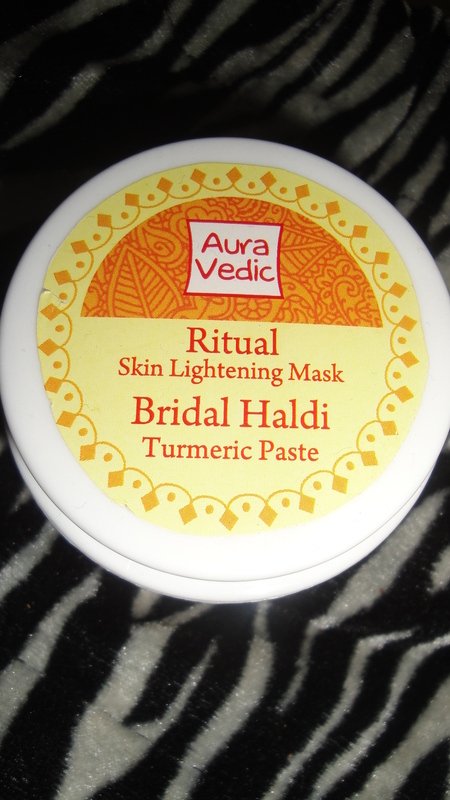 So when I received this Ritual Skin Lightening Mask from Aura Vedic, I had to give it a shot. But honestly, the main reason I was excited to try this face mask was its name! 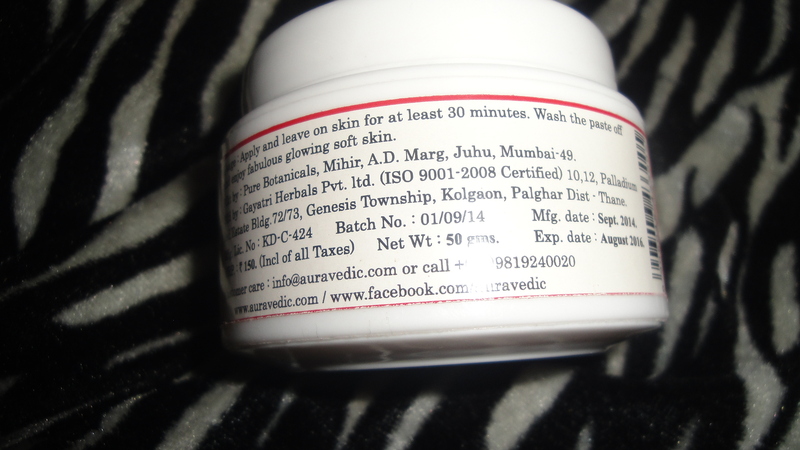 It is an Ayurvedic skin lightening face mask free from any harsh ingredients, parabens and chemicals. And then we all know the benefits of natural turmeric, sandalwood, and saffron for skin lightening and brightening. 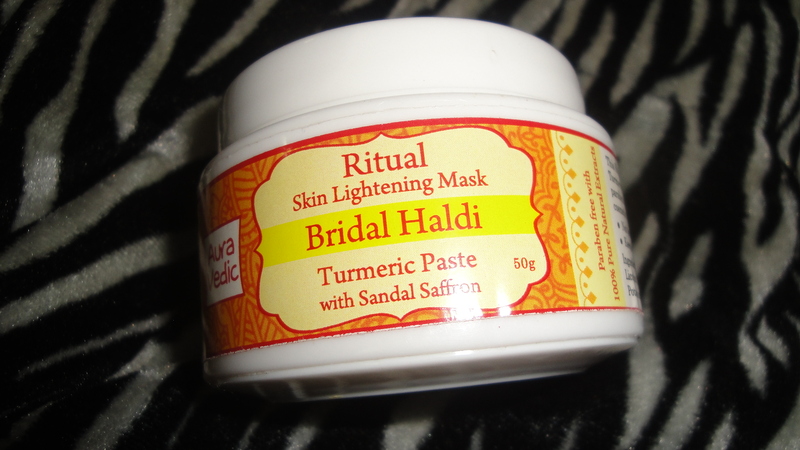 So as I read the name, ‘Ritual Skin Lightening Mask Bridal Haldi’ I had visions of myself as the radiant bride slathering on the ‘ritual haldi chandan ubtan’ all over my face and body for that enviable bridal glow! Enough of this blabber; let’s go straight to the face mask review now. The face mask comes in a simple white and yellow colored plastic tub packaging with a screw-open cap. The texture is thick and clay-like. It smells of turmeric, clay, and oil and looks like mustard paste to me with its pale yellow color and brown granules. Due to its thick, sticky texture it took quite an effort on my part to slather it evenly all over my face. It felt wet and heavy on the skin and took me 20 minutes to take it off. But as long as the product delivers impressive results, I don’t feel much bothered. My first impression after removing the face mask was however of disappointment. My face was all painted in a yellow cast! May be it was due to the presence of real turmeric in the mask. I had to wash my face all over again with the cleanser to remove the yellow hue. And viola! My skin looked ultra-clear and bright with a healthy glow after the final rinse. Besides Turmeric, Saffron, and Sandalwood, the other ingredients in the Auravedic ritual skin lightening mask include Tulsi , Licorice, Nagarmotha, Amla, Mulberry, and Papaya . All are well established natural skin lighteners. It’s been one month I’m using the face mask regularly once every week and my skin looks super bright, clean, and refreshed ever since. If you are looking for an affordable face mask for glowing skin sans any side effects or chemicals, this one can be your pick. Overall, it’s a decent Ayurvedic face mask with all natural ingredients. It’s affordable, free from chemicals, and suits all skin types. Even though it won’t lighten or whiten your skin as per claim but it will definitely make your skin look clear and radiant. With regular use you can expect to have a brightened complexion. Worth giving a try, so go girls get this if you like natural or Ayurvedic face masks for glowing skin. Auravedic products are great but this one seems to be an average one. I will skip this. Nice review dear.